Choosing a single plant as a gift can be overwhelming at times. If you are unsure of your recipient’s favorite bloom or color it can leave you at a loss as you scan all of the different options available in today’s marketplace. Would a mini rose plant be best? Or, should you go with something a bit grander such as an azalea or orchid? 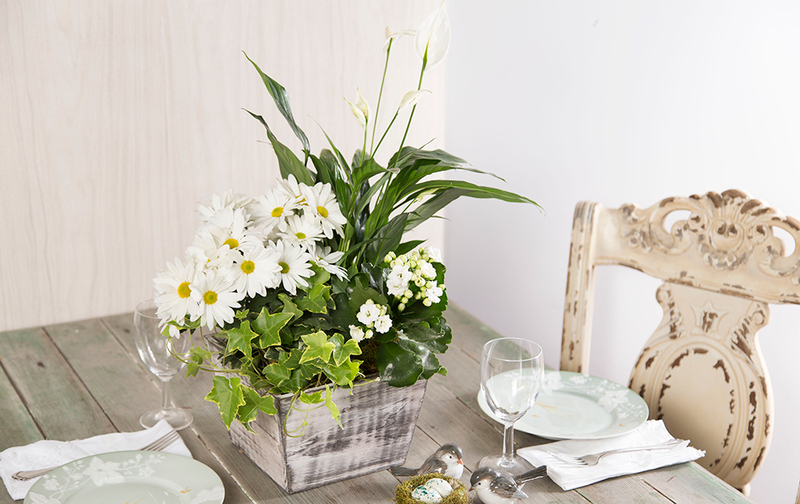 Bringing together flowering white chrysanthemum, white kalanchoe, spathyphylliums, and english ivy in a stylish white wash, distressed, on trend wooden container. One way to address this dilemma is to select a dish garden instead of a single plant. Dish gardens are a collection of plants that are arranged together by the floral professional to create an incredible presentation. Easy to care for, dish gardens are a perfect fit for most indoor décor, as they bring together a variety of textures and colors to complement any space. They make a fresh and inviting centerpiece, as well as a beautiful addition to a front entryway; a side table; or coffee table giving a room an airy, casual- living look and feel. 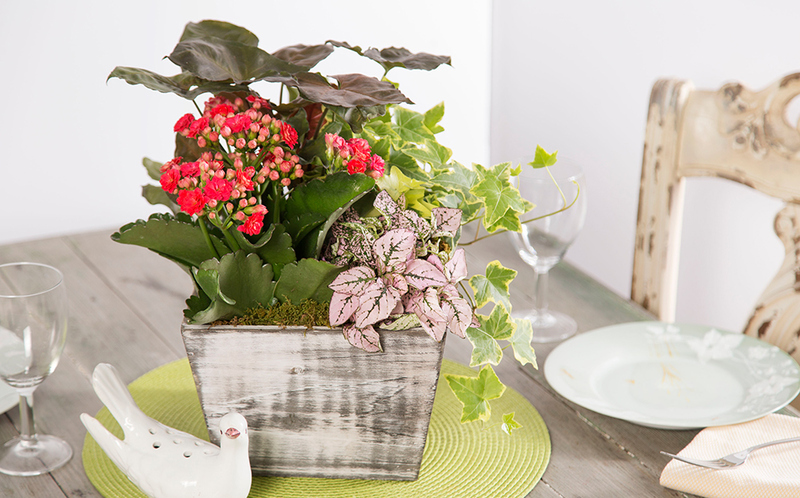 Bringing together bright pink kalanchoe, arrowhead, variegated ivy, and pink fittonia in a stylish white wash, distressed, on trend wooden container. Houseplants are certainly on trend right now (more so than in previous years) making dish gardens a great way to add to a plant lover’s collection when sending it as a gift. The recipient will love the combination of blooming plants, such as a mini rose plant, hydrangea, or kalanchoe plant set amongst the vibrant green foliages and textures of an ivy or dieffenbachia plant. 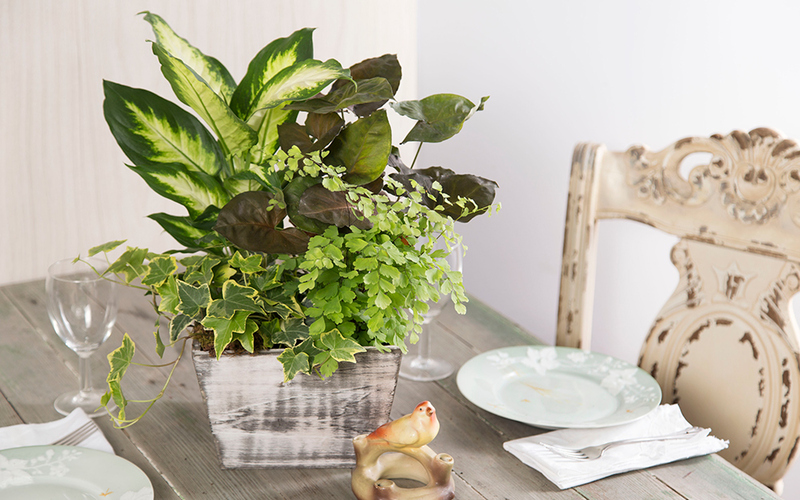 Lush and bountiful at every turn, this arrangement brings together maidenhair ferns, arrowhead, english ivy and dieffenbachia plants seated in a white wash, distressed, on trend wooden container. A great fit for any occasion of gift giving, dish gardens are a thoughtful hostess, housewarming, or thank you gift. So, when in doubt, dish it out!